Unexpected photos from Siem Reap Province, north-west Cambodia, signal hope for the country's wild cattle amidst threats from hunting and habitat loss. 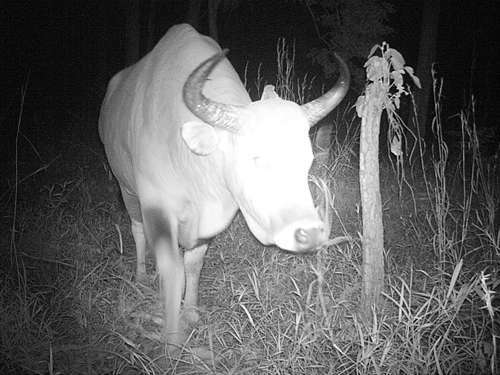 Positioned to gather local biodiversity data, hidden camera traps have captured photos of banteng, a wild cattle species of Southeast Asia, in an area of Cambodia's Siem Reap Province where the species was previously believed to be extinct. The camera traps were set by Fauna & Flora International's (FFI) Asia-Pacific Community Carbon Pools and REDD+ Programme and recorded six individual banteng (including three young). Hoof prints and dung were also found in the area. "The discovery of banteng in a region where few individuals remain and hunting risk is high signifies renewed hope for the species and emphasises the critical and urgent need for effective conservation in this region of Cambodia," said Rob Harris, FFI's Programme Manager, Asia-Pacific Community Carbon Pools and REDD+. The name 'wild cattle' might not conjure images of a species in danger, but with only a few thousand animals left in the wild (fewer than 8,000 according to the IUCN), it's undeniable that this animal faces a very uncertain future. Banteng (Bos javanicus) once roamed in vast herds across Southeast Asia from southern China to the islands of Borneo and Java, but today are listed as globally Endangered on the IUCN Red List. The once-thriving species has been reduced to isolated populations whose numbers are in sharp decline and are at risk from a long list of threats: poaching inside protected areas, habitat loss, hybridisation with domestic cattle and infections from domestic cattle diseases. Although numbers remaining are difficult to estimate, today Cambodia is believed to be home to between 2,000 and 5,000 individuals, the largest remaining world population of banteng (2011 WWF figures). According to the IUCN, research shows a 90% decline in Cambodia's banteng population in the last 50 years. Why do we need wild cattle? Banteng are a key High Conservation Value Forest (HCVF) species, a Forest Stewardship Council forest management designation based on an area's value, including the presence of threatened species and ecosystems and the services they provide to local communities. The discovery of banteng in this area of Siem Reap Province, home of Cambodia's world famous Angkor Wat temple complex, provides crucial information to inform and support better forest and habitat conservation and hunting regulation in the province. One of the banteng photographed in Siem Reap Province. Camera traps were set by Caleb Jones from Integrated Solutions Asia Cooperation, as part of FFI's Asia-Pacific Community Carbon Pools and REDD+ Programme‘s biodiversity survey team. According to FFI biologist Sam Un Eam, banteng play a key role in circulating nutrients through ecosystems, dispersing seeds and maintaining food chains, and are a critical food source for many carnivore species, including tiger, leopard and dhole (Asiatic wild dog). 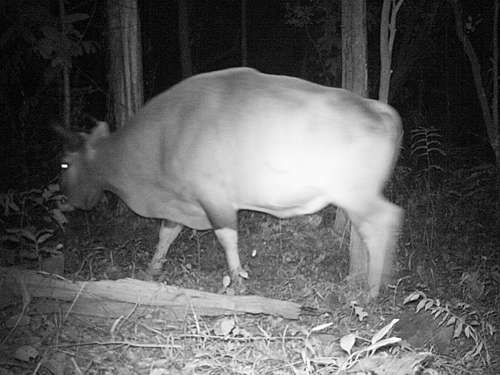 The camera traps that photographed the banteng in Siem Reap Province were set up by Caleb Jones of Integrated Solutions Asia Cooperation, as part of the Asia-Pacific Community Carbon Pools and REDD+ Programme's biodiversity survey team. Biodiversity surveys have been conducted for the area's plants, mammals, birds, reptiles and amphibians and have detected key species including pileated gibbon, sun bear and slow loris (a primate). Together with village-based interviews and spatial analysis, this biodiversity data contributes to determining the HCVF status of the site. "We involve local communities in the biodiversity assessments and engage community members to become guardians of these resources through community-based patrolling and biodiversity monitoring," Mr Sam Un said. Banteng play several key roles in the ecosystems they inhabit. 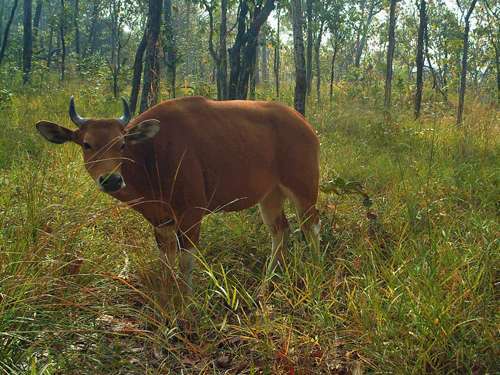 Camera traps that photographed banteng in Siem Reap Province were were set by Caleb Jones from Integrated Solutions Asia Cooperation, as part of FFI's Asia-Pacific Community Carbon Pools and REDD+ Programme‘s biodiversity survey team. "Any conservation programme is only as strong as its ownership,'' he said. "We want to engage and empower Cambodians to protect their endangered species and the recent discovery of banteng in Siem Reap Province shows that this approach to conservation is working." The Asia-Pacific Community Carbon Pools and REDD+ Programme works to strengthen laws and policies to facilitate the adoption of Reducing Emissions from Deforestation and forest Degradation (REDD+) in Cambodia, Indonesia, the Philippines and Vietnam, with a strong emphasis on engaging local communities in conserving and enhancing biodiversity to protect endangered species. A banteng photographed in Siem Reap Province. Camera traps were set by Caleb Jones from Integrated Solutions Asia Cooperation, as part of FFI's Asia-Pacific Community Carbon Pools and REDD+ Programme‘s biodiversity survey team. The Cambodian component of the Programme is implemented in collaboration between FFI, Non-Timber Forest Products Exchange Programme (NTFP-EP) and the Cambodian Forestry Administration.